The Global Afrikan Community Network (G.A.C.N.) is honoured to present its first annual Pan Afrikan Gala Fundraiser Summer Solstice Celebration. This years theme is “Purpose”. Join us on Saturday June 25, 2016 at the North York Civic Centre Community Hall. (Please see video attachment) Doors open at 5:30 pm with Dinner service at 7:00 pm. Dancing until midnight. This formal event will be hosted by Ms. Ivy Prosper, a Ghanaian/Canadian television personality and international model. Sister Thandiwe Chimurenga, mother of Toronto Pan Afrikanism; will be giving a keynote speech on the Pan Afrikan Movement, its PURPOSE then and now. The pouring of libation will open this magical evening. This years event will be catered by Chef Wayne and Chef Kareema. These two brilliant chefs will showcase their Jamaican and Trinidadian heritage by bridging together a powerful and flavourful expression of Caribbean Fusion. No celebration is complete without African music. This year we will be welcoming the Ubuntu Drumming Team and Dance Company, in addition to a DJ. Show off your own personal style as you dance to the sounds of the Caribbean islands and the African continent, rhythms ranging from traditional to modern day dance music. 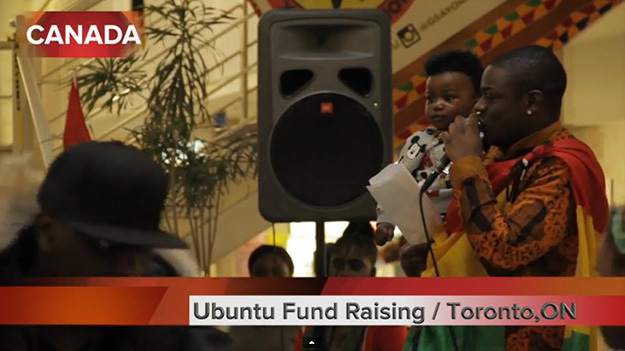 Our purpose for this fundraising initiative is to resurrect Toronto’s premier AfroCaribbean Cultural Centre, the plans for this project is to house and showcase various products and services for the AfroCaribbean community. Seminar space complete with audio visual capabilities and a commercial kitchen will also be housed in this unique space! The Global Afrikan Community Network (G.A.C.N.). We are a small group of Black professionals whose main goals are to support and promote Black business and Black professionals in our network; through networking events and fundraising initiatives. The G.A.C.N is so excited about this event and our plans are to create an evening that our community can be so proud of. Our goal is to have every Caribbean Island and African country with a Toronto presence, represented at this Pan-African event. We want to see each table of 8 showing support, unity and purpose for the island and country that they love! Organizations wishing to take advantage of hosting a corporate table can do so without a hassle, as the event tickets can be dropped of at your organization’s headquarters during business hours. Tickets are on sale now, via our family of ticket outlets (Below). Please visit our website at gacnto.com or please call me direct at (416) 454-3848 (Lori) if you wish to speak at anytime. Please view our video showcasing the Ubuntu Youth Drumming & Dance Team. The fundraiser proceeds will be helping them get to Jamaica. https://www.youtube.com/watch?v=I8mhFcs970Q The GACN’s Network family from around the Greater Toronto area and the GACN’s committee meeting of the minds. Why is the GACN fundraising? What are we working towards?….Here’s a sneak peek! Help us, get YOUR space!! Yes we are doing a program for the event and are accepting advertisement from businesses / organizations. Please send me your email, so we can send our packages. It starts from only $20 !